2018 SAMA Conference will be held in Boston! The New England Mosaic Society is thrilled to announce that the Society of American Mosaic Artists’ (SAMA) 19th Annual Conference will be held in the beautiful and historic city of Boston from March 13-18, 2018. Local conference co-chairs Deb Aldo and Glynda Benham have been hard at work on the conference bid since last summer, combing the city for the best locations to host the Mosaic Arts International (MAI) exhibits. Holding the conference in Boston has been a dream of Deb’s since 2008, when the late, and much beloved, Bill Buckingham, and former SAMA Board Member, Ed Kinsella (from MA), talked about putting together a bid committee. However, Deb’s dream had to be put on hold until 2015, when several New England artists at the SAMA conference realized that if Philly could have its own mosaic society, then why not us? Instead of just covering a city though, we went crazy and decided to cover all six New England states since our members are scattered over a much larger area…..and so the New England Mosaic Society was officially born in March 2016, and we now have nearly 100 members. As well as getting a new organization off the ground, we decided to push ahead with bidding for the SAMA conference, thinking that it would be at least 2020 before it might come to fruition. Boston is a very busy city where most gallery locations plan and book at least 2-3 years in advance. Pulling off the conference bid within a year of NEMS’ formation AND with less than two years’ notice to locate appropriate gallery space for MAI is a significant achievement. Deb and Glynda addressed the SAMA membership at the General Meeting in Detroit on Saturday May 6, 2017 following the announcement that Boston would be the next host city. 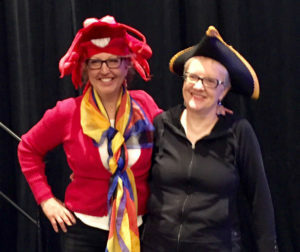 Dressed in lobster and tricorn hats, they gave the audience a quick introduction on “how to speak Bahstun”! If you are interested in volunteering to help with conference, please send an email to NEMS.SAMA.Boston2018(Replace this parenthesis with the @ sign)gmail.com with “Interested in volunteering for SAMA” as the subject line. Please provide a brief description of what you think your skills are. We need volunteers that can 100% commit to following through and staying on task. Volunteers will be needed during the next 10 months, and then before, during, and possibly after the conference, so also let us know what your preference is for a time commitment. Stay tuned to SAMA’s website www.americanmosaics.org and NEMS website www.newenglandmosaicsociety.org for more details as we get closer to the conference date.